As soon as the fixtures were announced, we had worried about the opening ten games. Arsenal away would be number ten. It’s been difficult to get a handle on this Everton side so far this season. Our manager doesn’t appear to be sure of his best eleven, our side is struggling to find its identity- do we play possession football? Do we play on the counter? If we are to play on the break, why have our wingers played so few minutes between them? And yet, there has been a sprinkling of the very good, too…. Wins against Southampton and Chelsea produced performances of the highest order. We were very good away to Swansea, but after defeat to Manchester United, and drawing with an average Liverpool side, it’s probably fair to say we’ve come off the simmer now. We’ve looked lost in possession at times, unsure of our plan. The cohesion in midfield has given way to confusion, while we’re back to looking soft in defence- particularly from set pieces. Things were about to get no easier for us. Having been brushed aside with ease by United, a trip to Ashburton Grove to face Arsenal- off the back of their win against Bayern Munich, and thumping of Man United before them. So, how would we line up? With two wingers for a start. Aaron Lennon with his second start of the season coming on the left wing, joined by Gerard Deulofeu on the right. The first time this season we’ve played two wingers from the start. The rest of the side remained as it was against Man United the week before. Howard’s weight has already gone to his left hand side here. 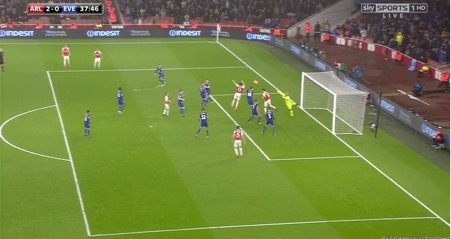 As Ozil shoots, Howard has tried to second guess Ozil, that he’ll likely put the ball to his left with a huge amount of the goal to aim at. In fact, why Howard is quite so far to his right to begin with could be another point of order. 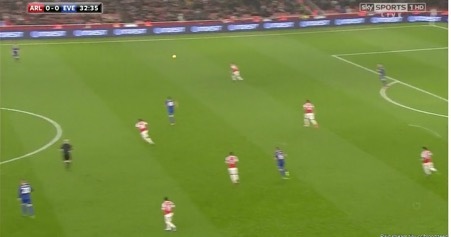 Should Ozil get any kind of loft on this ball, it likely goes in. It really doesn’t matter how you save them, as long as they stay out. Our very own Neville Southall used to say he thought saves with his legs were better than saves with his arms, and who am I to argue? So who cares? It’s a foul anyway, he keeps it out, so why mention it? 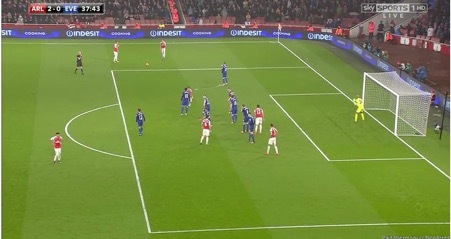 For the same reason I’ll mention this: an Arsenal head managed to meet three of their first four corners in the opening twenty minutes- none of them went in, but on another day? We’ve conceded a belly full of goals from set pieces already this season, but we’re still struggling with them. We still haven’t managed to make the necessary adjustments at Finch Farm to get us looking more solid. Howard’s technique is really hurting Everton at the moment. His tendency to pre-empt what the opposition player is going to do rather than reacting to what he sees means he’s letting himself down. It didn’t hurt us here, but it’s a familiar sight, and is greeted increasingly wearily amongst Evertonians. 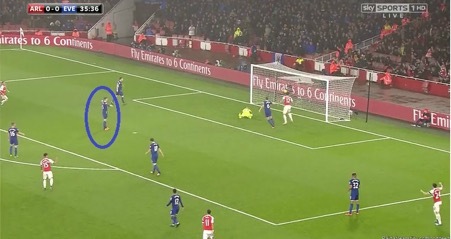 In this picture, Jagielka (out of shot to the right) has just tried to play a cross field ball to Seamus Coleman which was intercepted by Alexis Sanchez (just out of shot to the left). 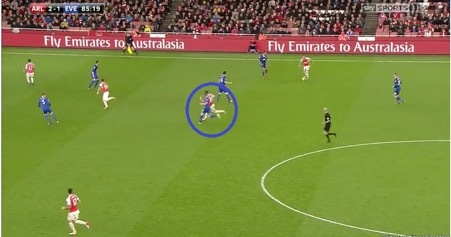 Note how advanced Arsenal are, and how tight Francis Coquelin and Mesut Ozil are to Gareth Barry and James McCarthy, forcing Jagielka to play the ball longer than he would’ve ideally liked. It was an uncharacteristically animated reaction from Stones. It’s clear to see the frustrations felt over Howard’s form are not limited just to the stands. As Coleman has the ball, Giroud denies him the space to play inside to Barry and sprints for Stones as the ball is played. Stones plays a one two with Barry but the return isn’t perfect and Giroud slides in…. Sanchez manages to race onto the loose ball and goes on to be tripped by Coleman as he raced to get back goal side and stop the move. It’s good play from Arsenal, Everton are susceptible to being pressed high up and they’re putting in an excellent shift at this point given several of them had played midweek against Bayern Munich (although admittedly Giroud had not started). That being said, it’s poor from Everton and is indicative of the rudderless play we’ve seen from them in recent weeks. It was asking for trouble and we found it- a set piece. It’s horrendous defending from Everton. At any level, this is unacceptable. Nobody gets tight, nobody denies him a clear run, an uncontested jump, nothing. It’s difficult to overstate how bad this is. The ‘keeper might dig us out, though? Nope. 2-0. I don’t know if he’s worried about taking a clattering here, but how he’s managed to end up this side of the ball is a mystery. And if I’m really technical about it, from where the ball is coming in and given his starting position, you could probably make a case to say he’s gone with the wrong arm. But I’d settle for a ‘keeper who doesn’t wear lead insoles who can read and react to what is going on in front of him- punching with the correct arm is a luxury that can wait at this point. Soft from Everton. This isn’t a side renowned for their set piece prowess…. This isn’t Stoke…. We haven’t reacted to them winning three of four corners early on and now we’ve paid. We’d manage to get a goal back before the half was out. Good work from Deulofeu and Barkley on the counter meant a deflected Barkley strike from distance found the Arsenal goal. Barkley has to shoot really, and it’s a fortunate goal to score, given the deflection. His supposed support have been left behind deep- presumably to defend the 2-0 defeat at this point, in no rush to join the attack. Arsenal have managed to get men back and are unlucky to concede. We can be out-skilled, out-played by a better side (who would go top of the league with a win here) but out-worked? We can’t afford less desire than a side with better players. Into the second half, and not much of note early on, aside from an injury to Phil Jagielka which forced him off. 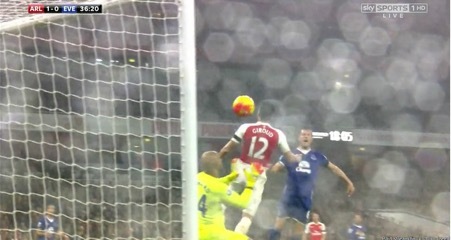 A good run from Gerard Deulofeu saw him commit a couple of Arsenal players before releasing the ball to Ross Barkley…. And end up with Tim Howard doing well to come off his line (is this real life?) and smother at the feet of Alexis Sanchez. Everton shooting themselves in the foot, again. Fifteen minutes into the half and Arsenal are threatening to click into gear. 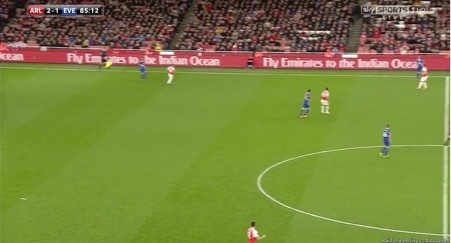 Ozil and Giroud in particular are causing a nuisance to us- Giroud had held the ball up well all game to this point, we’re not used to seeing Jagielka and Stones struggle with a striker as they did with Giroud. He was holding the ball up well, linking play and managed to clip the bar himself. 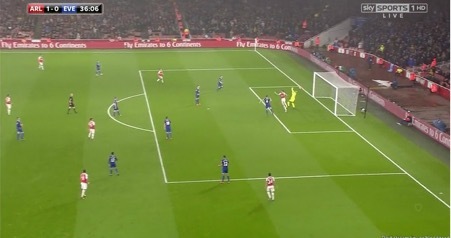 A host of half threatening moments as Ozil, Giroud, Cazorla and others started to find pockets of space. The next decent chance was to come to an advanced Brendan Galloway. 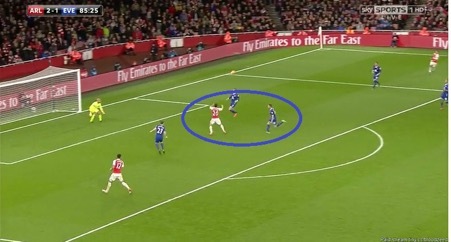 James McCarthy, poor to this point, managed to sweep a good, deep cross into the Arsenal box…. But Galloway doesn’t manage to get his diving header on target and the chance goes begging. It’s a relative ‘joy’, but we were getting some joy managing to get Deulofeu in behind Nacho Monreal. 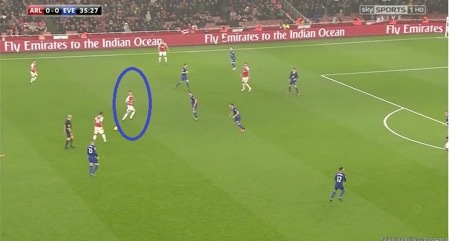 Set up to try and get the ball quickly to Deulofeu should Monreal be out of position having joined an Arsenal attack, Deulofeu had a couple of gallops in the second half and Monreal would be booked for tripping Deulofeu as he ran in behind him. It was a frustrating night for Deulofeu, the intent was there- he was trying to play quick balls into Lukaku, crosses into the box, but they just never really came off for him tonight. At least he had the intent, the desire to take some responsibility on the ball and try and make something happen. Lukaku did about as well as he could’ve given the anaemic service he yet again received, only Deulofeu looking to play with any invention to afford Lukaku even just the threat of a chance. For many, the time has now come to pick Deulofeu and Mirallas in the same side. It might work, it mightn’t. But a side that plays two holding midfielders should be able to play two attacking wingers. I say attacking because although Lennon is a winger, it’s clear he’s picked for his energy as much as anything else, but he did nothing against Arsenal to suggest his performance against Manchester United the week before could be put down to just rust, he was ineffective again. Mirallas and Deulofeu can both be game winners on their day, and both in the same side would give the opposition so much more to consider. It goes without saying, Lukaku would likely receive better service and more opportunities from out wide with those two than any other combination. He’s ploughing a lone furrow at the moment. A player who relies on instincts, it reminded me of the chance he had in his first year at the club when he was sent through one on one against Simon Mignolet in the derby, only to strike a similarly unconvincing effort that day, too. A touch of loft on the ball and he may well have scored, a better chance would not come for the toffees. Gareth Barry would see red before the match was up, but that was that. A good Arsenal side, playing on Everton’s struggles when squeezed in their own half, punishing dreadful defending. Somewhere between the slack work at the back, and the impotence of our midfield, the relatively good start against the better sides in the division are now a memory. A big couple of months coming up for the toffees before the Christmas schedule kicks in. Sunderland up next in the league.